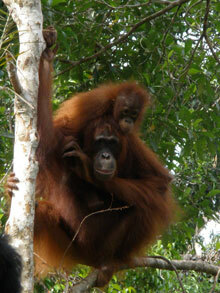 The orangutan is the only strictly arboreal ape and the largest tree-living mammal in the world. Although other apes do climb and build sleeping nests in the trees, they are primarily terrestrial (spending their lives on the ground). 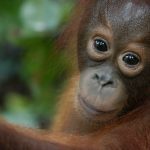 Even the bright reddish-brown hair colour is unique to the orangutan. They have the most remarkable ability to travel through the forest treetops. Each night building a new nest out of leaves and branches in the very tops of the trees – sometimes as much as 100 feet above the ground. Almost all of the food they eat grow in the treetops and the frequent rains fill the leaves, supplying them with drinking water. When water is difficult to find, they chew leaves to make a sponge to soak up the droplets in tree cavities. Although, when it rains hard, they might make an umbrella for out of big leaves. 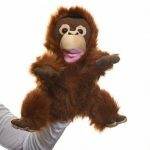 Some might say orangutans have four hands instead of two hands and two feet. These appendages make them graceful and agile while climbing through the trees, but makes walking on the ground somewhat slow and awkward. This is why they are at a great disadvantage on the ground, and rarely comes down from the treetops. 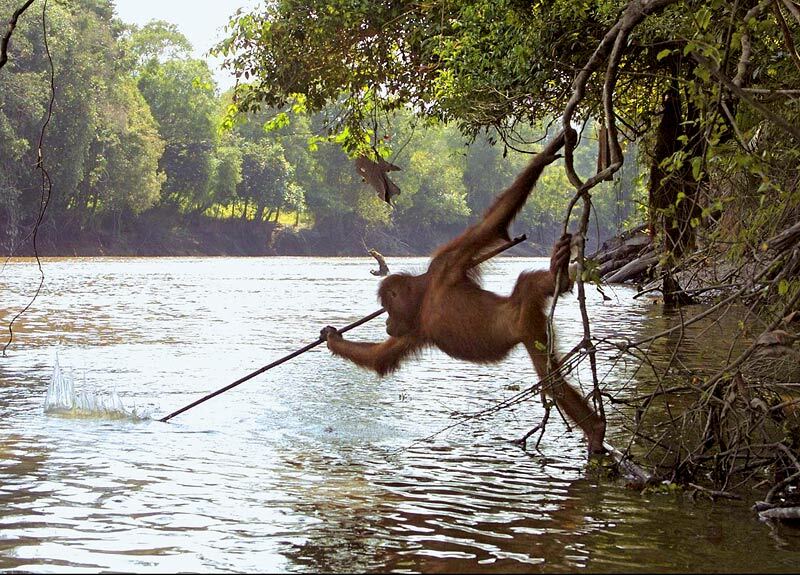 Recent studies show that some orangutans fashion tools to aid in the difficult task of foraging for food and have even been observed using sticks to catch fishing lines. 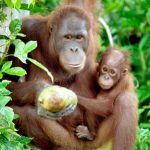 Orangutans&nbsp;emit a variety of calls and vocalisation including the ‘long call’ of males to attract females or discourage other males and the kiss-squeak, often made when observers get too close. To hear these and other calls, visit the Zurich’s University Anthropological Institute &amp; Museum here. 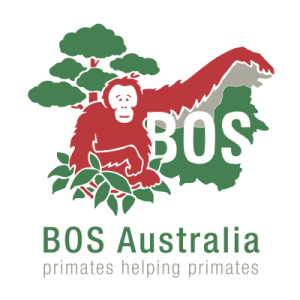 For recent news articles on orangutan behaviour, click here.